In news set to delight buddy and stoner film fans everywhere, Jay and Silent Bob have finally been green-lit for their return, Kevin Smith has confirmed. Smith, the writer and actor who’ll be returning in his titular role alongside his old friend Jason Mewes as Jay, took to social media to share the great news. 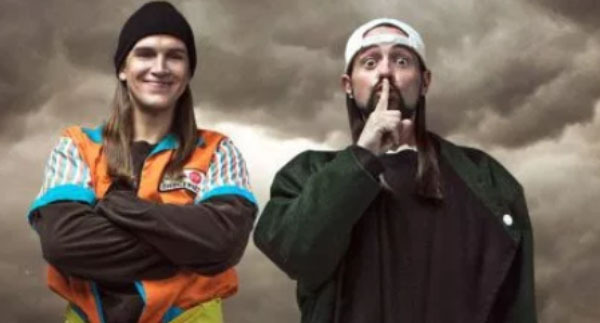 The film reboot has been picked up by Saban Films and it’s going to be called Jay and Silent Bob Reboot. SNOOTCH TO THE REBOOTCH! Thanks to Saban Films and Universal Entertainment, #JayAndSilentBobReboot gets the green light! He added that filming will start in New Orleans on February 25. Jay and Silent Bob first appeared in Clerks in 1994, and have since become the central figures in the cult classic and unlikely cultural phenomenon. They appeared in 1995’s Mallrats, Chasing Amy (1997) and Dogma (1999). And there was Clerks II in 2006, which most people prefer not to bring up. But the duo literally and fictionally managed to strike back with Jay and Silent Bob Strike Back (2001), which saw the overgrown man-children turn into fledgling franchise fodder. The characters got their own video games, animated movies and live performances. But the latest instalment could have a serious tone to it. Last February, I almost died. So, on the one-year anniversary of my widow maker heart attack, as a celebration of life and a big ol’ F you to Death, my best friend and I will be rolling cameras on a sequel/remake/reboot of a movie we first made nearly twenty years ago! In Jay and Silent Bob Strike Back, our herbal heroes found out Hollywood was making a movie based on them, so they journeyed out to Hollywood to stop it. But I’ve learned so much as a storyteller and have grown immensely as a filmmaker since then, so audiences can expect something completely different. But it’s still going to be meta as hell, you can rest assured. In Jay and Silent Bob Reboot our herbal heroes find out Hollywood is making a reboot of the old movie that was based on them, so they journey out to Hollywood to stop it again.